In May of last year the Boxing world focused it’s attention on the MGM Grand in Las Vegas, NV to see Floyd Mayweather and Manny Pacquiao, two of the sport’s biggest attractions over the last decade finally face off in what was a legitimate “Super Fight” scenario. A scenario that was not all that unlike the epic encounters of the 1980s featuring Boxing’s “Fabulous Four” Sugar Ray Leonard, Marvelous Marvin Hagler, Thomas Hearns, and Roberto Duran. All of those fighters fought during a time where there was not much posturing and simply put the best fighters fought the best. Although Mayweather-Pacquiao failed to live up to the anticipation that preceded it in terms of what happened once the two future Hall of Famers got in the ring, there is no disputing that it was a “Super Fight” in the sense of not only the anticipation of the showdown, but also in terms of how successful it was from a business standpoint breaking all existing pay-per-view and live gate attendance records. The question that has been asked since the Mayweather-Pacquiao fight is what fight could be made outside of a potential rematch between the two that would generate comparing interest that would be called a “Super Fight.” For some, the answer to that question would be encounter between undefeated unified Middleweight world champion Gennady Golovkin and two-division world champion Saul Alvarez. Much as was the case with Mayweather and Pacquiao, both Golovkin and Alvarez have significant fan followings and anticipation for a showdown between the two has only increased as each fighter has continued to face and defeat other opposition. What would have been a unification clash to further unify the Middleweight division was put on hold when Alvarez, recent holder of the WBC Middleweight world championship chose to relinquish that championship rather than be mandated to face Golovkin, the unified WBA/IBO/IBF world champion, who had also secured interim championship status in the WBC’s Middleweight ratings per his victory over previous WBC number one contender Marco Antonio Rubio in a defense of his unified world championship in October 2014. This put a showdown between two of Boxing’s biggest stars on hold. There is somewhat of a similarity between Mayweather-Pacquiao and a potential Golovkin-Alvarez showdown in the sense that Boxing fans have been asked to wait a period of time before an encounter between Golovkin and Alvarez comes to fruition, much in the same way that it took nearly a decade before Mayweather-Pacquiao took place. Although some can no doubt become frustrated when a fight that has significant public demand does not take place when that demand is seemingly at its peak, it does create a scenario where both Boxing fans and experts alike will remain tuned in to whatever either fighter does in the interim. The obvious question whenever a scenario like this takes place is will either fighter face opposition that can derail plans for a potential showdown down the line. Golovkin, who is now also recognized as WBC Middleweight world champion, for his part took care of business in his last fight on September 10th by stopping previously undefeated IBF Welterweight world champion Kell Brook in London, England. This set the stage for Alvarez to step in the ring in an attempt to win a second world championship in the 154lb. Jr. Middleweight division as he faced undefeated WBO world champion Liam Smith on September 17th at AT&T Stadium in Arlington, TX. As was the case when Golovkin squared off against Kell Brook, this fight presented a scenario of a significant favorite, in this case the fighter who entered as the challenger going against an undefeated fighter who was given little chance of winning the fight. Even though there is no disputing that fighters like Golovkin and Alvarez have become marquee attractions and stars of the sport, what always interests me whenever a fighter considered to be a star of the sport faces opposition that is not thought to be dangerous is whether or not the opponent can create a scenario where they can surprise not only the “Star/Superstar” fighter, but also those who thought of the fight as a mere afterthought. To his credit, Smith entered the fight unbeaten in twenty-four previous bouts prior to facing Alvarez and had scored eight consecutive knockouts including two successful defenses of the WBO Jr. Middleweight world championship. Although Smith was not known by some particularly due to having never previously fought outside of the United Kingdom before this fight, he should have been viewed as dangerous and deserved the respect of being a world champion. Smith is a fighter who is also known for being aggressive and it interested this observer to see if he could get the respect of Alvarez from the outset. The champion however, seemed to be at a disadvantage when the two fighters got in the ring due to Alvarez appearing to be the bigger of the two. Whether this was due to Alvarez being able to rehydrate following the weigh-in the day before the fight and getting in the ring at a much heavier weight is something only Alvarez can answer, but it was nevertheless noticeable. The disadvantage that Smith seemed to have would also show itself in the fight. Alvarez began the fight at a quick pace and almost immediately put the champion on the defensive. The difference in this fight in my eyes in addition to Alvarez’ size was Alvarez’ combination punching and how he was able to establish an attack to Smith’s body early on. Although Smith was able to be aggressive and land some offense in spots throughout this fight, his punches did not seem to have much effect on Alvarez in terms of his ability to hurt the challenger. The champion however, was able to open a cut on Alvarez in the second round before suffering a cut himself over the right eye in the fifth round. Despite facing a seemingly bigger fighter and absorbing significant punishment throughout the fight, Smith showed tremendous grit and determination by not only showing a willingness to engage with Alvarez, but also providing resistance for Alvarez to go through. The determination of the champion only increased as the fight progressed. This was on display when Smith was knocked down for the first time in his career by an Alvarez combination in the seventh round. Under circumstances where some fighters may have folded under the punishment, Smith showed his mettle by getting up and attempting to fight back. Even though Smith would go down for a second time in round eight before suffering a brutal left hook to the body that would end the fight in the ninth round, Smith was extremely “Game” and has nothing to be ashamed of. There may be some who thought of this fight as a formality given Saul Alvarez’ star status in the sport. Although the result of this fight was ultimately what some Boxing fans expected with Alvarez getting a knockout win over a world champion who was not widely known by some fans, particularly those who are casual observers of the sport, Smith’s effort in this fight was something that should be applauded. Under circumstances where a champion was not shown the respect he was due as a world champion and was dismissed by some as an afterthought, Smith fought his heart out and went out on his shield. Despite suffering the first loss of his career and losing his world championship, Liam Smith will likely benefit from the exposure he received in this fight and has probably established a new fan base here in the United States by the “Game” effort he put forth against Alvarez. Depending on what may or may not happen in the future with regard to a potential fight between Gennady Golovkin and Saul Alvarez, it is not out of the realm of possibility that Smith could find himself in position to challenge for a Jr. Middleweight world championship again at some point and may even be in position to challenge for the WBO world championship if Alvarez decides to challenge Golovkin for his unified Middleweight world championship with the theoretical scenario of Alvarez having to vacate the championship either before or after a bout with Golovkin depending on the outcome. Although it is not known as of yet as to how successful this fight was in terms of pay-per-view buys, it was successful in terms of live gate attendance drawing over 51,000 spectators. It will be interesting to see depending on how well this fight did as a pay-per-view attraction if those numbers will play a role in how quickly an encounter between Golovkin and Alvarez takes place. In terms of the immediate future, Gennady Golovkin appears to be heading toward a mandatory championship defense against current WBA number one contender Daniel Jacobs. 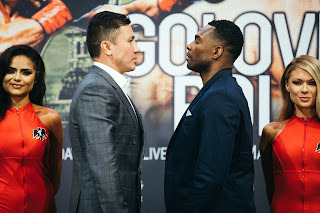 What this could mean for Alvarez is a potential fight against former Golovkin opponent Willie Monroe Jr. who scored a workmanlike twelve round unanimous decision over current Big-Knockout Boxing (BKB) Middleweight world champion Gabriel Rosado on the undercard of Smith-Alvarez. What will be interesting about a potential Alvarez-Monroe encounter will be where the fight takes place in terms of weight. It is likely based on recent history where Alvarez, who held a world championship in the 160lb. Middleweight division, but did not technically fight at the official Middleweight limit will possibly dictate that a fight between the two takes place at the Jr. Middleweight limit of 154lbs. or the fight could take place an agreed-upon “Catchweight” as has been the case in some of Alvarez’ recent fights. Although this observer is on record in expressing his not liking “Catch Weight” fights, the reality is especially in regard to the “Business of Boxing”, the fighter who is the draw and thus can earn not only himself, but his opponent significant money will have bargaining power in regard to where a fight takes place. As the Boxing world will likely have to wait at least until sometime in 2017 for a potential Golovkin-Alvarez showdown, the storyline will continue to be whether or not other opposition will be able to derail either fighter. Even though such a storyline is always interesting, it is my hope that Boxing fans will not have to wait more than a year for Golovkin and Alvarez to square off. This is of course assuming both fighters continue to win in the meantime. A rebroadcast of Smith vs. Alvarez can be seen in the United States on HBO on Saturday, September 24th at 10:05PM ET/PT and will also be available on the HBO Go and HBO now apps as well as HBO On Demand. For more information including additional airdates please visit: www.hbo.com/boxing. The official weigh-in for Saturday’s WBO World Jr. Middleweight championship fight between undefeated champion Liam Smith and former two-division world champion Saul Alvarez took place on Friday in Arlington, TX. The official weights for the entire card are as follows. Liam Smith (Champion) 154lbs. vs. Saul Alvarez 154lbs. Vacant WBO Intercontinental Middleweight championship – 12Rds. Willie Monroe Jr. 158lbs. vs. Gabriel Rosado 159lbs. Joseph Diaz (Champion) 125lbs. vs. Andrew Cancio 126lbs. WBC Youth Jr. Featherweight championship – 10 Rds. Diego De La Hoya (Champion) 121lbs. vs. Luis Del Valle 121lbs. *IBF North American Welterweight championship – 10Rds. Sadam Ali 146lbs. vs. Saul Corral 147lbs. Vergil Ortiz 139lbs. vs. Ernesto Hernandez 139lbs. Hector Tanajara 132lbs. vs. Roy Garcia 133lbs. Bryan Bazan 118lbs. vs. Joshua Franco 117lbs. Rayford Johnson 198lbs. vs. Anthony Yarde 185lbs. Larry Smith 153lbs. vs. Alexis Salazar 157lbs. Daniel Montoya 141lbs. vs. Zachary Ochoa 140lbs. Smith vs. Alvarez takes place tonight (Saturday, September 17th at AT&T Stadium in Arlington, TX. In the United States and Canada, the card can be seen on HBO Pay-Per-View at 9PM ET/6PMPT for $64.95. Contact your Cable/Satellite provider for ordering information. For more information please visit www.hbo.com/boxing. In the United Kingdom and Ireland, the card can be seen on BoxNation at 1AM (Sunday, September 18th Local UK Time) For more information please visit: www.boxnation.com. Check your listings internationally. Sometimes in the sport of Boxing one may wonder what some experts and fans alike look for in the endless search for rising prospects. For this observer, I tend to look for things that stand out whether it be a fighter’s skills or whether a fighter has charisma that seems to generate interest. In the case of rising Jr. Welterweight prospect Darwin Price both of those things stand out. Price, a native of Houston, TX began his professional career in 2013 and compiled an undefeated record of 10-0, with 5 Knockouts prior to his encounter with fellow rising prospect Javontee Starks on September 3rd at Cowboys Dance Hall in San Antonio, TX in a fight that headlined a Premier Boxing Champions card and a bout that was fought one pound above the 140lb Jr. Welterweight limit. This appeared to be the definition of a development fight for both fighters as each looked to take the next step in progressing toward contender status. In Starks, Price faced a slightly more experienced fighter in terms of professional experience having fought four more fights than Price had prior to the bout, but also a fighter who was at a similar stage having recently suffered the first loss of his career in October of last year in losing an eight round unanimous decision to then unbeaten prospect Samuel Figueroa. It interested me to see how Starks would approach this fight against another undefeated prospect. The story of this fight would be Price’s hand speed and combination punching. For seven rounds, Price consistently beat Starks to the punch throwing and landing double jabs followed by right hands consistently throughout the entire fight. What impressed me about Price’s performance in this fight was not only his commitment to throwing combinations often off of a double jab, but more specifically how he was able to control distance from the outset and create a scenario where he was able to dictate the ebb and flow of the fight where Starks was not able to be effective. Starks simply had no answer for Price’s hand speed as he was dropped from a double jab, right hand combination in the third round and simply could not find a way to nullify Price’s attack as the undefeated Price continued to dominate the action before the fight was stopped in the seventh round. Although there was simply not much to say about this fight, it was an impressive performance by Price that will surely generate interest. As for Javontee Starks even though he was outgunned in this fight, this observer does not believe that suffering two straight losses will set his career back too far. There are many stories throughout the history of Boxing of fighters suffering setbacks during the early stages of their careers where after a period of time those fighters were able to rebound and go on to have success. It will be interesting to see whether Starks will fight another fighter who is considered a prospect in his next fight or if he may look to face a fighter who would be considered a journeyman in an effort to boost his confidence. Although taking on a fighter who may have an unflattering record and who may not be well known is not always a sure formula to boost a fighter’s confidence following some setbacks, maybe it would benefit Starks if he could get back in the win column and manage to get a win or two against lesser-known opposition before facing another prospect to attempt to elevate himself toward contender status. As for Darwin Price it will also be interesting to see who he fights next. This observer believes that possibilities could exist in both the Jr. Welterweight and Welterweight divisions for Price. It is important to remember that Price has only had eleven pro fights and a question that is asked of virtually all prospects is how quickly will their handlers match them against someone who is considered a threat and/or a contender. Obviously, the answer to that question is one that varies depending on the fighter, but it is one that all prospects have to answer in time. Whether or not Price will face a fighter who can provide him a test in his next fight remains to be seen, but based on how well he performed in this fight it would not surprise me to see him test the waters against a fighter who is ranked in the top twenty to top fifteen range in either the Jr. Welterweight or Welterweight divisions. There are certainly plenty opportunities in both weight classes for rising prospects who were looking to climb the ranks. It may simply come down to what opportunities are available and if those opportunities are viable both from a Boxing standpoint of a fighter looking to establish himself as a player in the division and also from an economic standpoint. No matter what factors in to any decisions that will be made in regard to Darwin Price’s future opposition, he has established himself as a fighter to watch and if he can continue to progress he could well be a player in either division for years to come. The official weigh-in for Saturday’s Premier Boxing Champions card took place earlier today in San Antonio, TX. The official weights for the entire card are as follows. Main Event: Welterweight – 8Rds. Darwin Price 141lbs. vs. Javontee Starks 141lbs. Kent Cruz 137 1/2lbs. vs. Ricky Edwards 139lbs. Junior Castillo 162lbs. vs. Josue Obando 161lbs. David Perez 120lbs. vs. Gustavo Molina 121 1/2lbs. Eric Anton 129lbs. vs. Justin Pauldo 134lbs. Xavier Wilson 133lbs. vs. Frank Brown (Pro Debut) 134lbs. Brandon Soto 126 1/2lbs. vs. Tannder Dodd 127lbs. PBC: Price vs. Starks takes place tomorrow night (Saturday, September 3rd) at Cowboys Dance Hall in San Antonio, TX. The card will be televised in the United States by NBC Sports Network at 8PM EST/5PM PT. Check your cable or satellite provider for time and channel in your area. The card will also be streamed on the NBC Sports Live Extra app. For more information about NBC Sports and NBC Sports Live Extra please visit: www.nbcsports.com/liveextra. Check your listings internationally. For more information on the Premier Boxing Champions series please visit: www.premierboxingchampions.com.